In the clip above, Kate Jennings Grant (C'92, Counterparts) plays Judith Cameron, the mother of sisters Kate and Laura. In this past week's episode (spoiler alerts ahead! 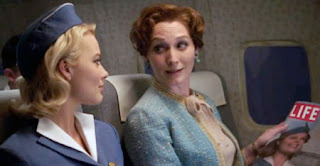 ), Judith boards the plane where her daughters are stewardesses to try to convince her daughter Laura to return to the man she left at the altar. I'm sure we can expect future episodes with Kate. And if you're wondering where you may have seen Kate in the past, she played Diane Sawyer in the Oscar nomaminated film Frost/Nixon, ...and she's been on Broadway! In the clip below, watch Kate perform "Marry the Man Today" (as Sarah Brown) with Lauren Graham (as Adelaide) from her 2009 role in "Guys and Dolls". Kate's got a beautiful voice!